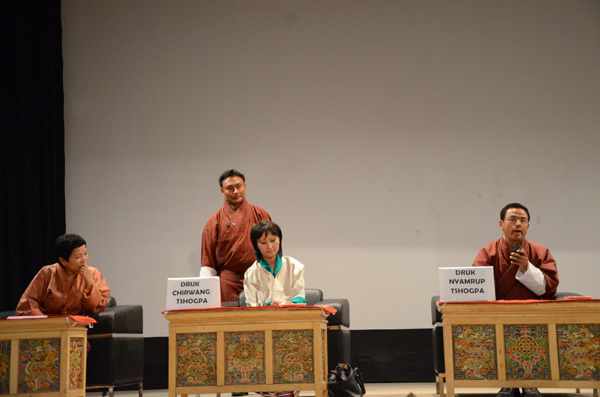 April 3, 2013 was a historic day in Bhutan: at the Royal Thimphu College all five registered political parties in the nation participated in the first common forum. Myself and my fellow Wheaton classmates sat within the front rows of the auditorium to witness this event. The stage looked like the set of an American talk show with five empty chairs perfectly positioned and awaiting their guests who would soon be soaking in the television lighting. 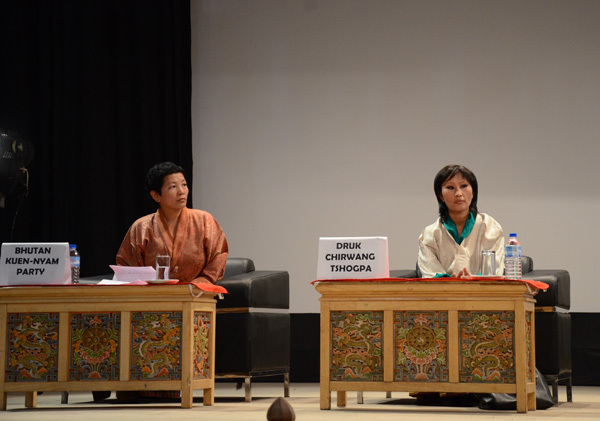 At the onset of the forum RTC Director, Dasho Tenzing Yonten used the King of Bhutan’s words to remind the audience that “democracy isn’t just about voting but also engaging.” That was the purpose of this forum—to have political parties engage with citizens, namely students, and vice versa. Bhutan transitioned from a political system of absolute monarchy to a Democratic Constitutional Monarchy in 2008. On July 13 of this year Bhutan will hold its second national parliamentary elections for the National Assembly. During the first elections the people of Bhutan only had two registered political parties to choose from. This time there will be a primary round of elections to narrow the field down to two parties for the general election. Per the Election Commission, however, the occasion was not to turn into any type of campaign event; it was intended to remain an educational, informative session free of election season politics. 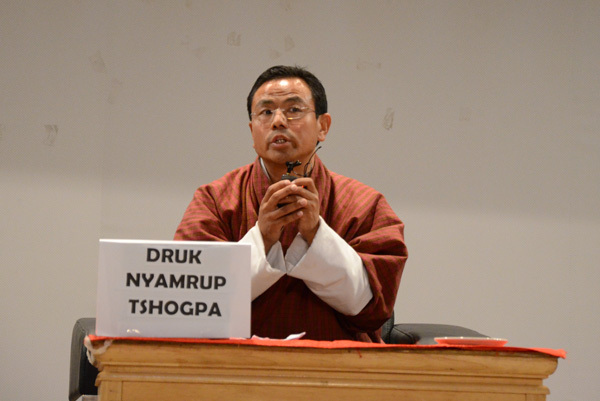 The format was simple; each party representative had fifteen minutes to introduce their party’s ideology to an audience of RTC students, faculty, staff, and the press as they were taped in a BBS (Bhutan Broadcasting Service) televised special. A question and answer period followed. Among attendance was a party spokesperson, a party vice president, two party presidents, and the education minister. The major themes that arose out of the parties’ introductions were all informed by standard politicking. 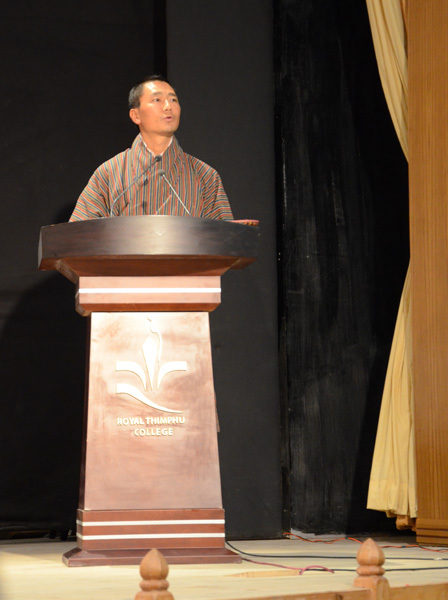 There were a lot of talking points about “standing together for the progress of the country,” “politics should not divide us,” “we are one Bhutan,” “the youth is the future of the country,” and “I love women.” What the brief speeches lacked, however, were any new ideas or substantial policy positions. In short, the parties were not all that unfamiliar to those who follow standard American political talking points. If I had to pick the most notable statements throughout the forum two of them would come from the People’s Democratic Party (PDP) President. The first was the invoking of Ronald Reagan’s famous question from the 1980 Presidential Campaign where he turned to the camera during a debate and asked the country “are you better off than you were four years ago” (referring to Jimmy Carter’s term in office). At this forum, the opposition leader asked this same question of the ruling party’s (Druk Phuensum Tshogpa or Bhutan Peace and Prosperity Party) five year term. This is a very effective political technique deployed by parties not in power and time will tell whether Bhutanese citizens feel they are better off after a DPT government. The second noteworthy statement during the forum made also by the PDP President was during the very last minutes of the event. Responding to a question he referenced the Education Minister’s claim of much lower unemployment numbers by the end of his party’s five year term, and hinted at a conspiracy with the numbers coming out of the DPT-led Labor Ministry. Whether or not this claim has any basis in fact remains to be seen, but this is a familiar tactic by those who follow American politics and the 2012 election. The same claim was made by surrogates of the Romney campaign about the U.S. unemployment numbers that were coming out of the Obama Administration. This was a bold claim and it will be interesting to see how the press handles it. Finally, the most exciting moment of the forum was not the Bhutanese Watergate (when a spokesman needed a drink of water at the podium and the DPT and PDP leaders rushed to his aid, pouring and delivering a glass of water), but the moment when the same spokesman recited Abraham Lincoln’s famous words from the Gettysburg Address, “government of the people, by the people, for the people.” It may have had a certain American in the audience chanting “USA!” in his head. 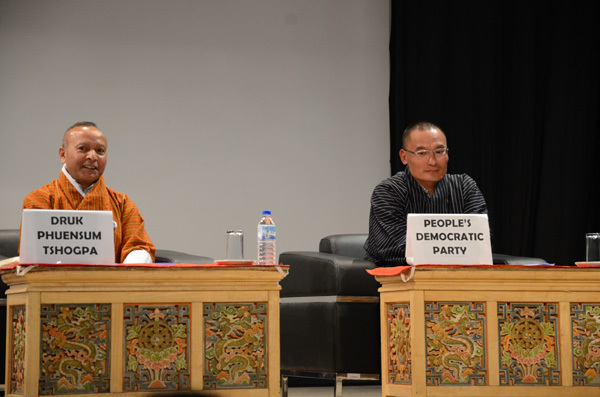 Overall the forum was an important achievement for Bhutan’s democracy—despite the content’s imperfection. Much of the discussion was focused on the role of youth and women in the election. With two of the political parties having female presidents, it will be exciting to see if the world’s youngest democracy will soon have a female prime minister.